This was my 4th visit to Trostan: 1st was via neighbouring Slievenanee and 2nd and 3rd were via the perpetually wet Moyle Way/Ulster Way approach to the west. On the 3rd visit we did the entire MW over 2 days and came down Trostan via the hellish 'route' through part of Glenariff Forest Park to the SE of the mountain. This time we chose a new route I'd spotted on the map after the last time. This involved following a track which arcs around the E and N of the mountain. We parked at a small lay-by on the B14 road at 193220 D then walked NE to the forest edge on our left. We crossed a fence with a handy plastic tube then followed the line of the forest a short distance to reach the track, which is more a grassy path. From here we followed the track NE until it split then followed the main spur which passes under a line of cliffs on Trostan's eastern slopes. This route is delightful, with a gentle incline and fine views of the the cliffs above and of the surrounding hills and out to sea. 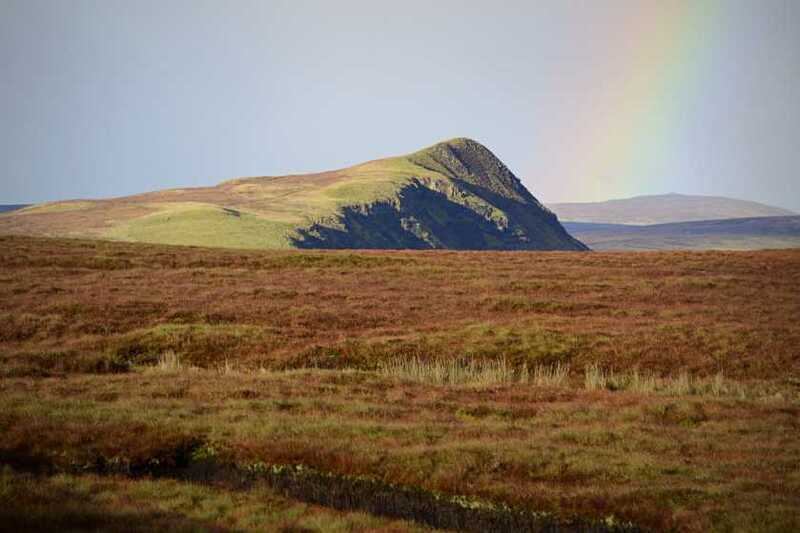 The steep eastern face of nearby Tievebulliagh rose from the surrounding bog, with a rainbow to the right. The route passes a large grassy mound which you can walk up, as well as several waterfalls. The evening sun was almost blinding as we rounded the northern slopes and walked the last section of the track, which ends at a fence running from Trostan to Tievebulliagh (182244 E). From here it's a wet enough slog to the summit trig, but definitely not as bad as the MW route. The evening light was stunning on Trostan's barren, reddish top and views included south to Slemish, the Belfast Hills and Lough Neagh, west as far as Inishowen and north across Rathlin Island to Islay. The cliffs of the Mull of Kintyre came in and out of focus. As light was fading we chose to take a more direct route down by heading parallel to the forest edge. The terrain was fine at first but got tougher near the bottom. We entered the northeastern offshoot of the forest by climbing under a fence over a stream (191223 F) but felling had taken place here and the ground was very wet and uneven. We eventually reached the road by climbing the fence next to a bridge, with the car just a short distance to our right. Ideally we should have avoided the forest altogether and if we'd had more time could have aimed for the track again, while not following its entire route. Overall though this was a very enjoyable hike which gave a totally new perspective on Trostan. I'd definitely recommend using the track if you have time. Our entire loop was still only 6.9kms.